Jennifer Clark represents numerous types of healthcare providers, including hospitals, dialysis providers, home health agencies, ambulatory surgery centers, senior living facilities, physicians, and many others. Jennifer represents clients in both the regulatory aspects and in the litigation of healthcare-related issues. Her practice includes assisting clients with the extensive regulations that apply to healthcare providers, including state certificate of need laws, Medicare and Medicaid certification issues, licensure laws, and reimbursement questions. Jennifer handles peer review and credentialing issues, reporting requirements to various state agencies and boards, and other legal issues that arise from the daily operation of healthcare facilities. 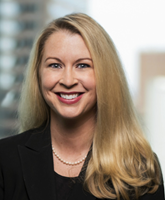 Jennifer is an active member of the Birmingham Bar Association, Alabama State Bar, and American Health Lawyers Association, along with numerous other organizations. Jennifer is a graduate of both the Alabama State Bar’s and Birmingham Bar’s Leadership Forums. Jennifer serves on the Board of Directors of the Alabama Kidney Foundation, the Executive Leadership Team of the American Heart Association, and is active in a number of other charitable organizations in Birmingham and throughout Alabama. In the past, Jennifer was an adjunct professor at Samford University, where she taught a class in trial advocacy.